I tend to go back and forth on “Battle Lines”. I think it's because, on paper, it sounds like an almost paint-by-numbers Star Trek story reminiscent of nothing so much as Original Series episodes like “A Taste of Armageddon”, “Day of the Dove” and their ilk (and indeed, “Day of the Dove” was a primary inspiration for “Battle Lines”). As such, what usually tends to happen is I watch the episode, like it a whole lot, then go a long while without seeing it, forget how much I like it and think “oh, it musn't be that good. It's basically an Original Series episode and I hate it when Star Trek: Deep Space Nine just chases the Original Series”. Then I watch it again and love it. Writing this essay should finally break that cycle for me, because “Battle Lines” is most assuredly excellent. Bear in mind I adored “Battle Lines” at the time, and that probably says something. 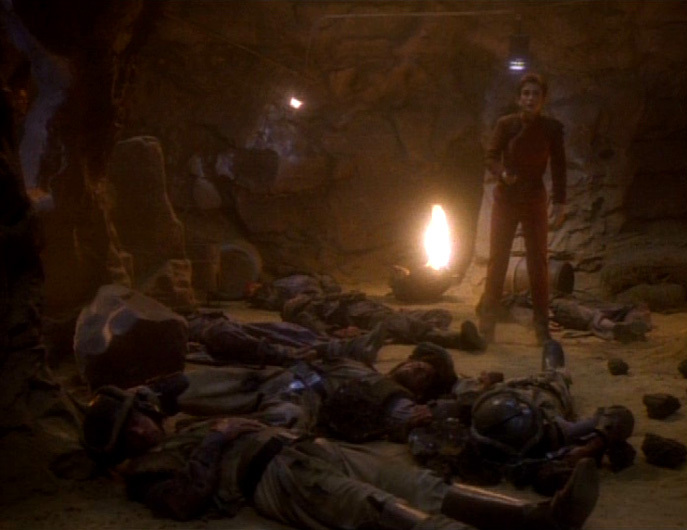 I especially loved the gritty iconography of these ageless, immortal soldiers constantly slaughtering each other in a bombed out desert cave on a godforsaken moon somewhere with Major Kira and Commander Sisko caught in the middle. In hindsight, yes, it's just another Planet Hell shoot, but for me this is among the most memorable uses of that venerable old studio. It's probably because the slightly Mad Max-esque Ennis and Nol-Ennis have a kind of grungy, 1980s post-apocalyptic aesthetic to them that I quite like. We haven't seen much of that in Star Trek: The Next Generation/Star Trek: Deep Space Nine since the aesthetic's glorious peak in the Gatherers of “The Vengeance Factor”, costume designer Bob Blackman seemingly preferring to emphasize a kind of forced frumpiness in his outfits for the chronological 1990s. It's perhaps not coincidental then that “The Vengeance Factor” was the final episode aired in the chronological 1980s. However that said I find it really interesting, now that I've brought it up, how we seem to be seeing little echoes of “The Vengeance Factor”, or at least the zeitgeist it was a part of, showing up again this season. The Gatherers themselves showed up in “Vortex”, and they were every bit as fantastically 80s as there as they've always been. And in “Battle Lines”, we once again have a story about a ceaseless war stemming from clan conflicts that may have meant something at one time but which are beyond ancient and petty by now. It's very fitting that little signifiers like this start to crop up again in Star Trek: The Next Generation/Star Trek: Deep Space Nine this season, as I consider 1993 and 1994 to be the real last hurrah of the Long 1980s, before the vibe finally gives way to the grimdark and apathy fueled Long 1990s and the climate we're arguably still living in today. It's also perhaps not a coincidence that this season is far and away the best the series has ever been. “Battle Lines” itself is a good demonstration of this, and a lot of its strength comes from the very thing that, at first glance, comes across as its most Original Series-esque aspect: The rather explicit moral about the futility of war and fighting conveyed through two opposing armies who, thanks to the inability of any of them to die, are literally just fighting because “you're this and I'm not”, in the words of various creative team members. It's such a classic kind of Star Trek morality play trope that you think it has to be derivative of something else, but it actually isn't. It's a simple, almost trite, message (even the names of the combatants almost sound like they should come from a parody of this kind of story: The Ennis and the Nol-Ennis), but damn if it isn't conveyed with startling and sobering effectiveness: I mean, this really is conflict boiled down to its most basic and fundamental roots. “You are one thing and I'm another and this is unacceptable. Ergo, I must kill you”. It frankly doesn't get much more real than that when you get right down to it. But what sets “Battle Lines” apart in this regard is its strong emphasis on empathy and forgiveness: Where the Original Series was defined by the crew swooping in, issuing proclamations and telling everybody how to do things, Star Trek: Deep Space Nine delivers the story that's the most in keeping with its commitment to healing, rebuilding and rebirth that we've seen so far. First, there's Commander Sisko's empathy with and forgiveness of the prisoners. As he curtly explains to Doctor Bashir in a scene that is as much a showcase for Avery Brooks' range and an air-pounding rejection of the Prime Directive as it is a statement of themes, it doesn't matter what the crimes of the Ennis and Nol-Ennis originally were, they've certainly more than paid for their crimes after centuries living on this hellish and inhumane prison planet. They deserve the opportunity to move beyond the violence and bloodshed that's defined their existence and start new lives. This is of course brilliantly paralleled with Kai Opaka's subplot with Major Kira. Nerys is not proud of the things she had to do as a member of a guerrilla resistance movement that operated with terrorist tactics, and she doesn't want her hero Opaka to think she's a heartless killer. But what Nerys doesn't fully understand is Opaka's infinite capacity for empathy and forgiveness: She accepts Nerys not in spite of the things she had to do, but because of them and, through her pagh (naturally, the eternal life-force that we all share which binds us all together), helps her come to accept herself too. And this is perfectly played by two absolute masters, Camille Saviola and Nana Visitor, who deliver just grippingly powerful displays of theatrical emotion and drama. It's a scene that's not only pitch-perfect Star Trek: Deep Space Nine, because, as Opaka just about spells out, acceptance of ourselves is the first step towards bettering them and leaving negative energy behind, it's also a wonderful follow-up to “Frame of Mind”, which touched on almost exactly the same sentiment. Once again, the two halves of Star Trek compliment, rather than oppose, one another. Speaking of Kai Opaka, her exiting the narrative here certainly bears repercussions. For me, this was always the point at which I felt the series left the “Early” Star Trek: Deep Space Nine phase and entered the “Peak” Star Trek: Deep Space Nine phase. Not because Opaka is a poor character or Saviola an underwhelming presence, in fact the contrary; I'll get to mourning her loss here very shortly. But her absence sets in motion what is in many ways the show's definitive story arc: The war of succession in the Vedek assembly for the honour of succeeding Opaka to be the next Kai. A war that starts in earnest at the end of this year, explodes into the forefront to usher in the next and becomes a looming, ever-present question that hangs over the rest of the series. It's a war that forces the Bajorans to confront some deeply-rooted ugliness at the core of their idealized aspirational planet state that brings an unparalleled level of nuance to the setting, and somewhere within these next five months is Star Trek: Deep Space Nine's finest hour. And yet as good as those future stories are going to be, the show loses something massive with the departure of Camile Saviola's Kai Opaka. She was a vividly iconic part of “Emissary”, just as much as anyone else was. She was originally intended to be a recurring character and her relationship with Commander Sisko would only have continued to deepen in complexity and nuance. Had she been given the chance, Kai Opaka could have been just as integral a member of the unofficial main cast as Rom, Nog and Garak, and I personally would have loved to see that. Camile Saviola has an uncanny and beguiling mystical presence that hints at hidden depths, and to me that's a more apt fit for Star Trek: Deep Space Nine's brand of storytelling than the Machiavellian machinations of Louise Fletcher and Philip Anglim's Vedeks Winn and Bareil, as well handled and interesting as they are. But, the script called for a character who was effectively a redshirt, and the team thought it would be more respectful to the audience to write out a recurring character. And Kai Opaka was the only one they felt they could afford to let go. As it sets up what is arguably the show's biggest story arc, it's easy to miss how “Battle Lines” is also a subtle proof of concept for another important part of Star Trek: Deep Space Nine's formula. One of the biggest criticisms the series would get from fans is that due to its stationary setting, it was thought that this crew wouldn't be able to indulge in the spirit of exploration that was so beloved in older Star Trek works. But “Battle Lines” demonstrates how this is not only possible, it's something that can be given a fresh twist by Star Trek: Deep Space Nine's unique perspective. Materialistically speaking, the station has a component of Runabout starships and a nearby wormhole that links them to the other side of the galaxy. It's really not unfeasible to expect they'll be sending scientific research teams over there to see what they can find, and Miles O'Brien even tells Keiko this in the second episode, seemingly anticipating fan grumblings. But beyond that, in this episode Commander Sisko, Major Kira, Doctor Bashir and Kai Opaka are on what amounts to a spiritual journey through the Celestial Temple, and the Kai even phrases it in terms of finding one's place in the universe and one's own life's work. Even Julian starts talking in terms of unlocking the mysteries of life and death, although he phrases it in the rhetoric of the philosophy of science. This is a reading I graft onto Star Trek: The Next Generation as well of course, or a reading similar to it, but this particular manifestation is an easier fit for Star Trek: Deep Space Nine thanks to its streamlined clarity of focus that jettisons a lot of the militaristic baggage Star Trek as a franchise inherited from Gene Roddenberry and the Original Series. The Enterprise is the voyaging canoe to be sure (even if nobody except me agrees that it is), but Deep Space 9 has that Celestial Temple and seems custom-tailored to tackle these issues from the outset. It seems curiously reflected in Kai Opaka's own resurrection. Only by listening to the universe will we discover our newfound purpose. Even, and especially, if it's not exactly where we thought we were going to end up. I love the idea of the show being shunted into a side Universe by Opaka's 'death'/retirement, much as we all are by sudden loss. I imagine a universe where Opaka didn't go along on the mission, and ushered Bajor through the entire DS9 epoch... although, knowing Winn, she'd probably meet with an accident anyway by the end of Season 2... I wonder if the tension later to be explored in 'The Circle' would have come to a head with Opaka still in office? Interrupted by the surprise arrival of Opaka, quite an event, but even that itself just leads into Opaka's curiosity at the Temple and Sisko's willingness to give her a tour of it and keep on going. For ten minutes there's no way to even guess where the journey might go, or that it might go to a war-without-end planet prison and a TOS style parable. Lovely post Josh. I really, really like this one a lot too, for all the reasons you state above. The leaving behind of the Kai when I watched it a few months actually left me feeling bereft it touched me that much. And yes, the themes woven in here do touch on what I love in the show - i.e. the more spiritual, mystical and non-militaristic.